Julie Kennard read music at the University of Southampton and then went on to the Royal College of Music to study singing with Ruth Packer. Julie has always specialised in oratorio although early on in her career she took lead roles in several operas. She has appeared in all major UK concert halls and Cathedrals and in many venues abroad. In Ireland, she was a soloist in Mahler’s Eighth Symphony for RTE Television and Bach’s Mass in B Minor; in Italy, Poland, Switzerland and France she performed the role of Dido in Purcell’s Dido and Aeneas; in Iceland she featured as soprano soloist in John Speight’s Symphony No. 2 for the Symposium of Nordic composers – a work she has subsequently recorded. Verdi’s Requiem has also played a large part in Julie’s career and she decided to stop singing that great work when she reached 80 performances! English music has featured strongly in her repertoire and she has regularly been a soloist at the Three Choirs Festival. 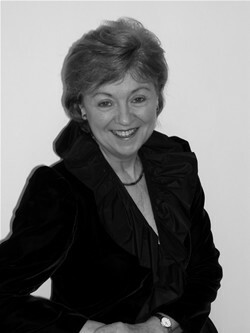 Julie has given numerous performances of Vaughan Williams’ Sea Symphony, Elgar’s The Kingdom, Apostles, Spirit of England and Caractacus, Herbert Howells’ Hymnus Paradisi and Britten’s War Requiem. The War Requiem was highlighted in a television documentary of Britten and showed Julie singing in a commemorative performance from Coventry Cathedral with CUMS and Stephen Cleobury. Julie has premiered works for composers such as Joubert, William Matthias and Pavel Novak. There have been recitals in the Brancaster, Chipping Campden and Chelmsford Festivals featuring a programme that she shares with her husband Michael George. Solo recitals in Luxembourg and at the Three Choirs Festival have featured Schumann’s Frauenliebe und -leben, and On this Island by Britten. More recently she has performed the Four Last Songs by Strauss, Sieben Frühe Lieder by Berg and Wagner’s Wesendonk Lieder. She was the soprano soloist in a programme of words and music celebrating the life of Admiral Lord Nelson with Richard Baker or John Sergeant as the narrator and some years ago in a programme in a programme of words and music featuring Dame Judi Dench and her family. Brahms’ German Requiem has featured numerous times over the past few years – one of which was in the Istanbul Festival with King’s College Cambridge. Julie’s recordings show her versatility – Monteverdi’s Christmas Vespers, Haydn’s Nelson Mass with St. Paul’s Cathedral, Howells’ Hymnus Paradisi with Vernon Handley and the RLPO and a CD of Victorian and Edwardian Carols entitled “All Hayle to the Days”. She also enjoys teaching singing at the Royal Academy of Music and is the Artistic Director of the Grove Park Music Festival.